Linux Foundation Certified System Administrator (LFCS) Complete Video Course, 2nd Edition has 21 hours of comprehensive video training for you to have everything you need to study for-and pass-the LFCS exam. 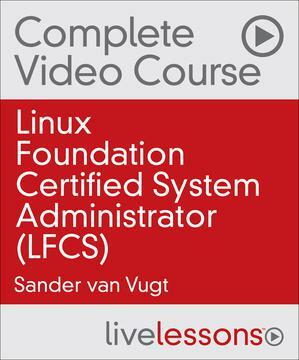 Linux Foundation Certified System Administrator (LFCS) Complete Video Course, 2nd Edition has 21 hours of comprehensive video training on the LFCS exam. You get more than 10 hours of Linux basics in Linux Fundamentals LiveLessons along with a full review of all Linux Foundation LFCS topics. Coverage includes advanced system administration, security, storage management, SSH services, and virtualization. This thorough and engaging training provides whiteboard concept teaching, live CLI work, screencast teaching, hands-on labs, command reviews, and a practice exam so you have everything you need to study for-and pass-the LFCS exam. To offer this course in the way that is most efficient for you, the contents have been developed to build upon your existing knowledge of Linux. You will start with Linux Fundamentals LiveLessons, a full video course on Linux basics, concepts, practices, and theories so you can get the foundational knowledge you need. You will then dive into the core part of the LFCS exam-including Advanced System Administration-and managing storage, security, SSH services, and virtualization. Each lesson ends with a lab for you to practice the skills learned in each lesson. These labs also act as training for the hands-on LFCS exam. After Sander presents you with the lab task, you have the opportunity to walk through it yourself. And the end of each lesson is the Lab Solution, where Sander walks through the correct way to complete the lab were you taking the real exam. A full practice exam is also provided so you can fully prepare for the exam. The practice exam sets up scenarios that you will solve and also provides video solutions so you can check your work against the author's. This is an invaluable part of the study experience.